In 1801 John Chapman, the man we’ve come to know as Johnny Appleseed, began his barefoot westward journey from Massachusetts. 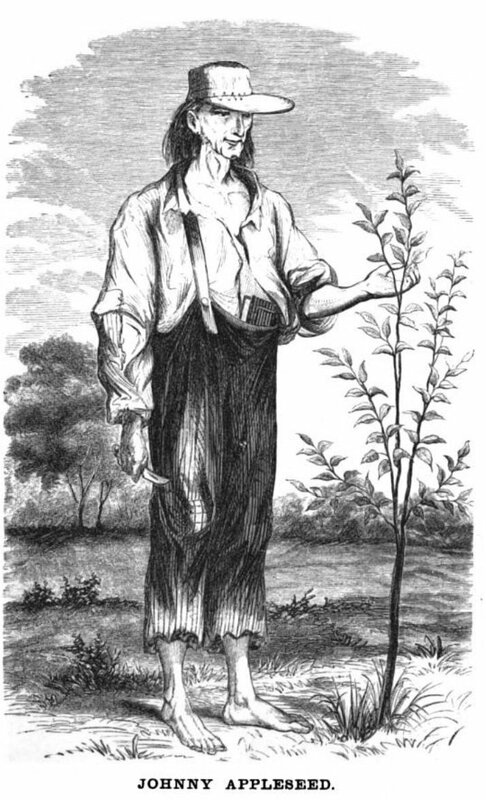 A tall man with pioneering aspirations, John set out for western Pennsylvania at age 23 to stake his claim on land by planting apple seedlings. In popular culture John is often depicted as an eccentric man in threadbare clothes and a soup pot hat, wandering and leaving a random trail of apple trees in his wake. He is said to have preferred sleeping outside and never owned a home. 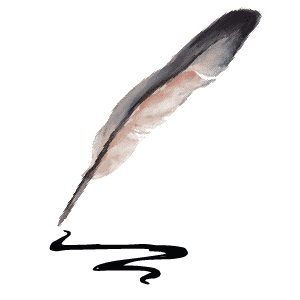 While there is likely some truth to his eccentricities, there was also an economic strategy to his seed-sowing method. He would plant nurseries and return a few years later to sell off the orchards, which helped him to establish claimed land along the frontier. Along the way he spread the word of his Christian Swedenborg faith (inspired by Swedish scientist and philosopher Emanuel Swedenborg); he considered himself a missionary, and would often preach in the areas where he was planting. Johnny planted and sold apple seeds and started tree seedling nurseries in areas of Pennsylvania, Ohio, Indiana, Illinois, and parts of what is now considered West Virginia. By the time of his death circa 1845 (the exact year is a common topic of dispute), Johnny had covered an area of about ten thousand square miles, all the while promoting his beloved apples. Many of his original apple trees still grow in the orchards he planted. His birthday, September 26, 1774, is now celebrated each year as Johnny Appleseed Day. Because Johnny’s apple trees were grown from seeds (rather than grafted), their fruit was quite tart and only suitable for making applejack and hard cider. 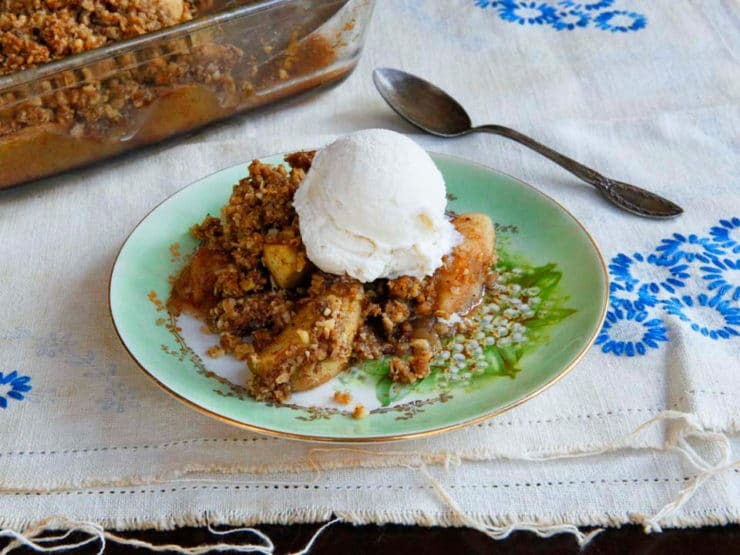 This sweetly spiced Old Fashioned Oat Nut Apple Crisp is the opposite of tart; I can just imagine Johnny in his soup pot hat sitting down to a warm serving topped with cool, rich vanilla ice cream. Apple season is in full swing now, which means it’s a great time to find affordable, quality fruit at your local grocery store or farmer’s market. 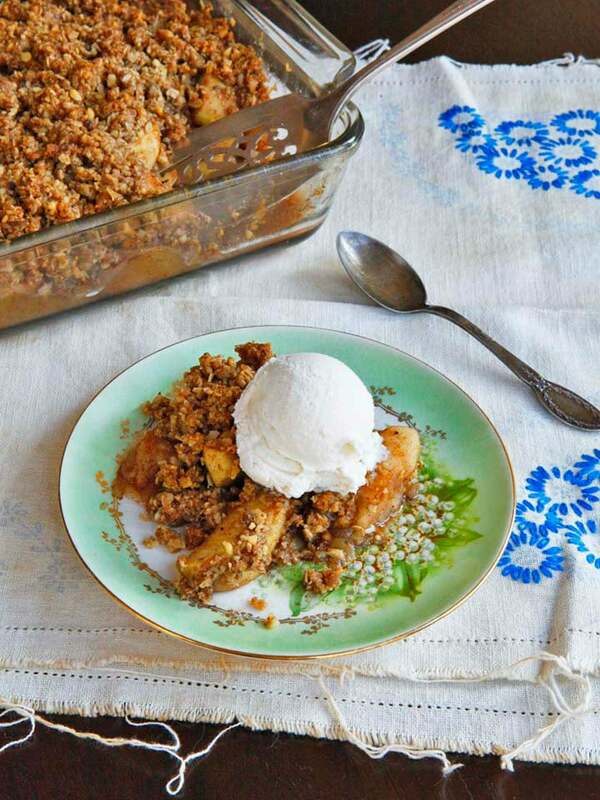 For the filling I use green apples, which hold up well to baking. I also use minute tapioca as a thickener for a better texture and to soak up the excess liquid that collects in the bottom of the baking dish. The tapioca is optional, but I do recommend it for best results. The topping is hearty with a light crunch thanks to the addition of oats and nuts. 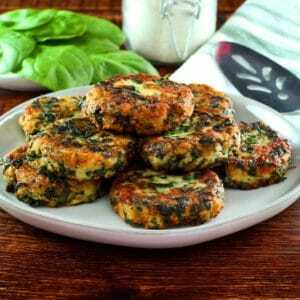 It can be made gluten free by omitting the flour and using gluten free certified oats. This old fashioned dessert is so easy to make and extremely satisfying. 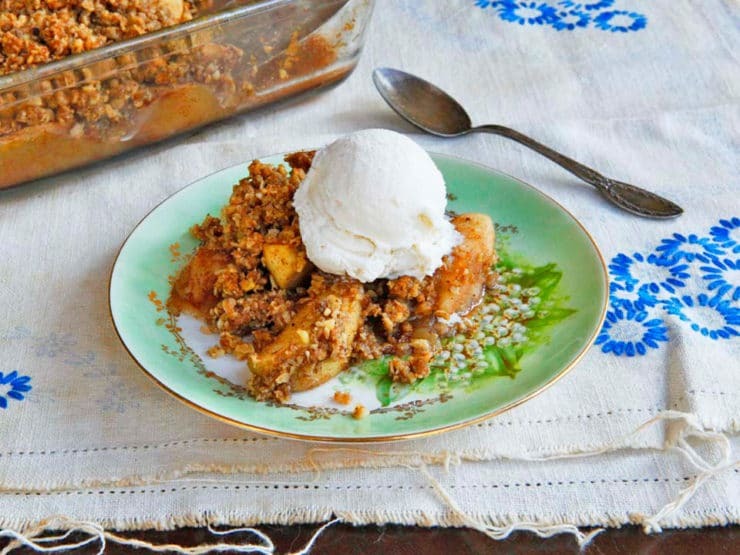 A simple and scrumptious recipe for old fashioned spiced apple crisp with a hearty topping made with oats and nuts - walnuts or pecans. 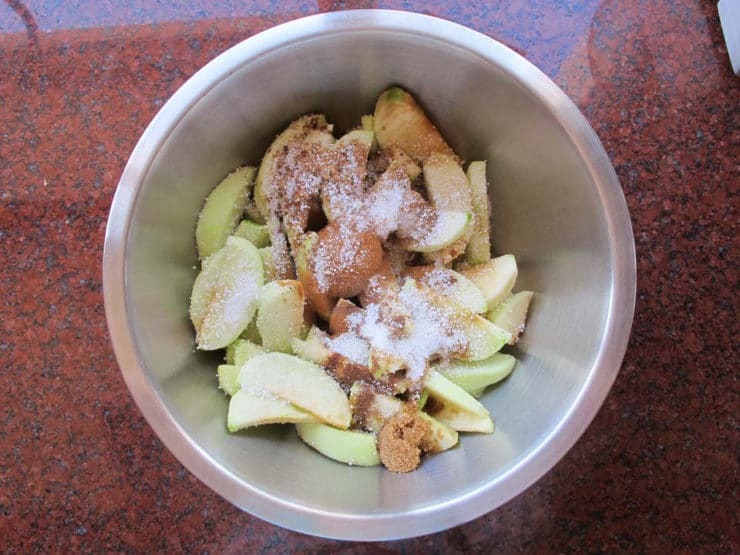 Preheat oven to 350 degrees F. Place the apple slices in a large mixing bowl. Add 3 tbsp white sugar, 3 tbsp brown sugar, 1/2 tsp cinnamon, allspice, nutmeg, cloves, minute tapioca and vanilla. 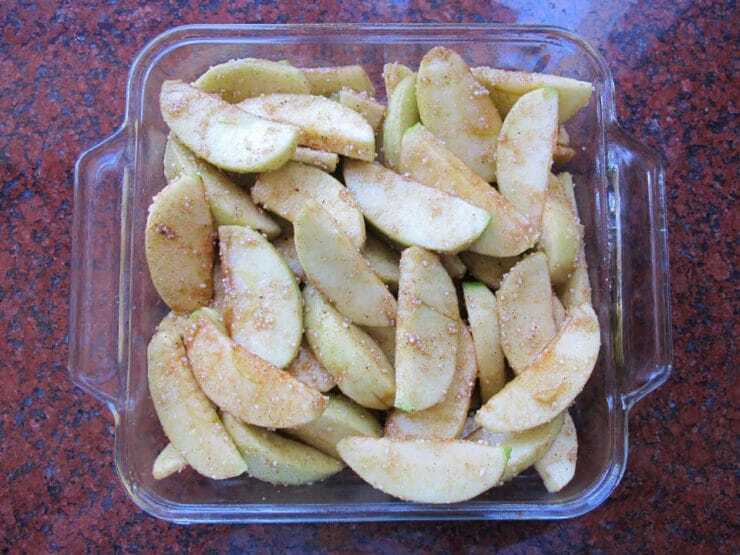 Stir the apples with the spices, tapioca and vanilla until they are fully and evenly coated. Let the apples stand for 15 minutes. 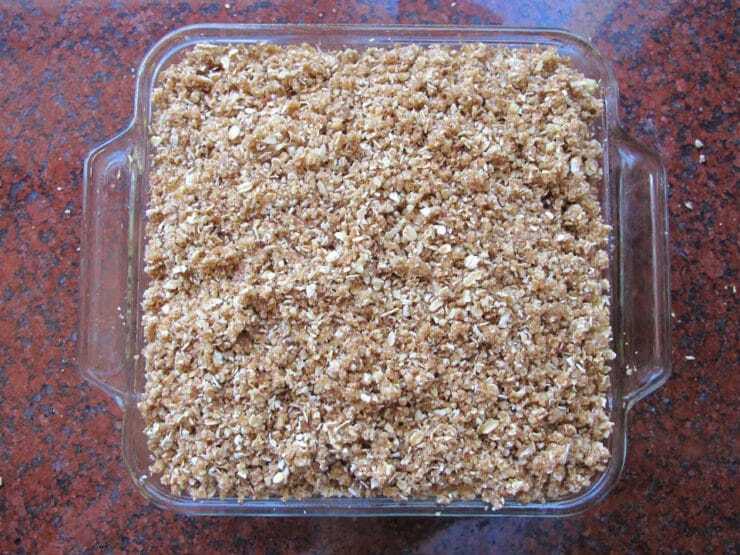 Note: the tapioca is a thickener; you can make the crumble without it, but juices will collect at the bottom of the baking dish and the texture won't be as nice. If you are skipping the tapioca there is no need to wait 15 minutes, you may proceed with the recipe. Meanwhile, fit your food processor with a blade attachment. 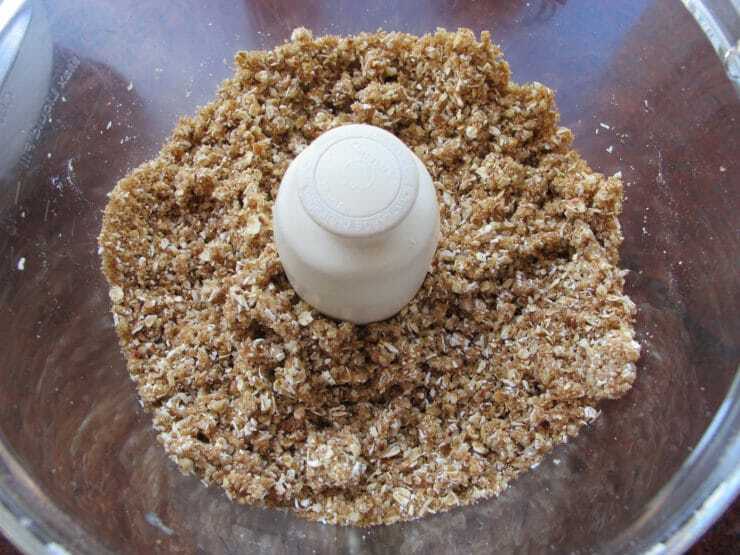 Add the oats, nuts, remaining 1/2 cup brown sugar and 1/2 tsp cinnamon, flour, salt and butter chunks. Pulse the ingredients together until the butter is broken up and coarse crumbles form. If you don't have a food processor, you may cut the butter into the dry ingredients with a pastry cutter or two knives. In this case, use chopped nuts rather than whole. Spray your baking dish with nonstick oil. Pour in the spiced apples along with any excess liquid from the bowl. Spread the apples out into an even layer in the dish. Cover the top of the apple layer with an even layer of the oat mixture, making sure all of the apples are covered. Bake on the middle rack of the oven at 350 degrees F for 1 hour until the apples are baked through, the top is nicely browned and the edges are bubbly. Let the crisp stand for at least 10 minutes after you bake it to allow the juices to settle before serving. Mound each warm serving onto a dessert plate topped with ice cream or whipped cream. Means, Howard B. Johnny Appleseed: The Man, the Myth, the American Story. New York: Simon & Schuster, 2011. Print. Rich, Chris. In Praise of Apples: A Harvest of History, Horticulture and Recipes. Asheville, North Carolina: Lark Books, 1996. This looks great and I want to make it for the holiday. If I make it the day before, will it be good the night night reheated? And if that is ok, what is the best way to reheat? Yes, it should be fine. Reheat at 350 degrees F for 15-20 minutes or until heated through, until it bubbles and the topping appears crisp. Enjoy! Can this recipe be altered for Passover? Absolutely love it and want to try and make it for my Seder on Saturday! I am writing from Israel where the 2 choices for tapioca (only items I found) were pearl tapioca – cooks 15-18 minutes or tapioca flour/powder. The flour came in a HUGE BAG… like a kilo! And for 1 Tbs. I will be using this tilk the cows come home.am wondering if I just used corn starch. If so…how much? Thank you! Hi Malina, Tori’s assistant Ashley here. You can substitute the tapioca with the same amount of cornstarch. It’s best to mix the cornstarch into the sugar before adding so that it can be more evenly dispersed through the mixture. Hope this helps! So funny Malina, also in Israel, and I was looking for the Tapioca everywhere at least the cornstarch was an easy find. Shana Tova everyone. A question: Is there a sub for tapioca? A suggestion: how about subbing coconut oil for the butter? 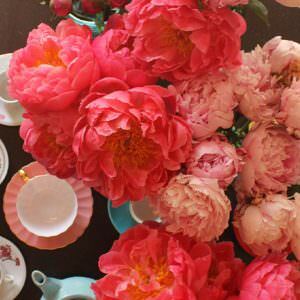 Thank you for so many delicious recipes. Your photos are wonderful! Hi Malina, Tori’s assistant Ashley here. In this recipe the tapioca is used as a thickener, so you might try cornstarch instead. We haven’t made it with cornstarch, so I can’t say for sure that the results will be as nice. Coconut oil for the butter sounds like an interesting substitute, though I really do like the flavor the butter lends to the recipe. This was even better the day after I baked it. I’m not sure why…. I did cut down on the sugar a tad in both apple mixture and topping. It was delicious. Mmmm! It’s in the oven now. Only thing I did differently was use candied pecans, cause my daughter had a craving and used up all my pecans last night. I also omitted the salt since there is some in the candied pecans recipe. 🙂 Smells so good!!! I love the idea of tapioca. I’ve seen it in the store, but thought it was used just to make pudding. I always wondered why my recipes with apples tend to be a little more watery than I want. Now I really need to try this recipe. My husband loves apple crisps. In addition, I will begin adding tapioca to my other apple recipes that have become too juicy. Sue– yes! Tapioca is a miracle. I use it as a pie thickener too. Just make sure it’s “minute tapioca,” it works best for this type of thing. Enjoy the crisp! Great idea for Thanksgiving. Needs to be pareve. Not a big fan of margarine. Wonder if a mixture of half vegetable oil and half Crisco would hold the nut-oat mixture together. Richard try Earth Balance vegan buttery sticks, they’re non-hydrogenated and the closest thing to butter for baking IMO. I find that Earth Bound is so thick! I use half light olive oil plus half sugarless applesauce (fresh or jar). The results are not the same but pretty good. For Dairy I use Land o Lakes butter/margarine in the white cup with a green lid. I use it because it melts if it is out of the frig. 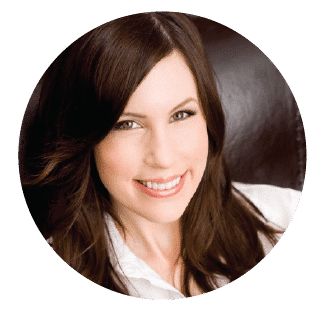 Is it possible for you to do a page or link to healthy substitutions? Just thought, would healthy mayo be a good substitute for butter and then it would be parve? Hi Mashugana– for vegan butter subs Earth Balance (not Earth Bound– maybe a different product?) is far superior to any other subs I’ve tried. It’s pretty butter-like, especially in baked recipes. It’s also non-hydrogenated unlike some margarine brands out there. I don’t think I can do a healthy sub page, simply because what is healthy to one person is not to another… some feel that margarine is unhealthy, while kosher readers often prefer it because of the meat/milk thing. Some are diabetic, others have high cholesterol, others are gluten free, still others keep a Paleo diet… there are so many varying needs out there, so I kind of have to go with the way I eat and suggest modifications when somebody asks for them on a case-by-case basis. Personally I feel the old fashioned way is almost always best, especially with a dessert like this. I don’t like artificial sweeteners (or artificial anything, really) but I totally understand the need to use them when diabetes is a concern. I wouldn’t sub mayo. That said, the margarine would be fine as a sub for the butter and won’t impact the flavor of the finished product much at all. Too bad we just missed the Avila Apple Festival! Would have loved to go to this! And what about my Diet.? I am on a diet, use Splenda! I use almonds because it has a different carb rise than other nuts, If you can have oats, then you see the substitutions that Tori stated in an above comment. I make two of everything, one for me, and one for my diabetic husband. I use cupcake cups to guarantee that I do not eat more, or make as stated and place in portioned containers. As for the butter, depending on what diet you are on. I have made tons of crisps but not like this one, and will make this weekend, once I purchase tapioca. Love the idea of adding tapioca! This crisp is soooo tasty looking! Would this freeze well? I want to bake it tonight and save for Shabbat. Hi Paulette, I have never frozen this so I’m not sure. It may turn out a bit more “crumbly” after freezing, but it’s that kind of dessert anyway, so I’m guessing it won’t be a big problem. If you give it a try let us know! This looks delicious! I’d like to add cranberries. I love that this recipe doesn’t seem too sweet, but would sugar need to be adjusted with addition of cranberries? Any other adjustments do you think? Thanks! Hi Andrea– fresh cranberries cook up quite tart, so yes I would add a bit of extra sugar. Offhand I’m not sure how much– perhaps start with an additional 2 tbsp granulated sugar? Enjoy! Your recipe looks amazing. Can you make this in a 9×13 pyrex? If so, would you adjust the ingredients? Many thanks! Hi Francine, I would add another half recipe… use 3 3/4 lbs. apples (additional 1 1/4 lbs. ), 1 1/2 cup oats (extra 1/2 cup), and the same with other ingredients to fill the extra space in the baking dish. I was just wondering if I’m allowed to “share” on FaceBook when I like a recipe. I was thinking it would get my friends interested in your site from time to time. I’m allergic to both walnuts and pecans…is there a substitution that you’d suggest or would it be fine to just leave out the nuts? Hey Katie! You can leave them out, but I would add another 1/4 cup of oats. Enjoy! Vanilla Tofutti is a delicious non-dairy alternative to ice cream. It can be found at both Whole Foods and most kosher markets – at least in Connecticut where I live.